When I think about innovation and gadget development, I imagine technology that enhances daily life. In this article I will tell you about some these 3 impressive hygiene innovations. Doing research on what’s trending and currently making a positive impact in the hygiene world, I came across some impressive hygiene innovations that not only promise to make life easier - i.e. toilet finder apps - but also makes life interesting; specifically the groundbreaking “Super toilet”. Last but not least, I discovered the latest in hygiene development; namely bacteria-repellent surfaces that protect against harmful pathogens. SitOrSquat: This app allows you to find the nearest bathroom in a map or a list. “Sit” ratings are given for clean bathrooms, and “squat” ratings are given for loo’s best avoided. Whizzer: Similar to the above, this app also shows bathroom locations around you, along with a cleanliness rating and available facilities (eg baby changing stations). Flush: With over 200 000 bathrooms in its database, you can easily find a bathroom closest to you. What’s more; you can find out additional information for example, if you need a key to use this bathroom, plus it is able to run without an internet connection. Bathroom Scout: Much like the other toilet finder apps, this app allows you to scout for toilets in the area, has user ratings and also has turn-by-turn navigation to direct you to the nearest loo. Where to Wee: For ultimate user convenience, this app is colour coded. Grey is unrated, green is clean, yellow is not-so-clean, and red means keep away! If you are a shy toilet user, there is even an app called “Fake Shower” that mimics the sound of running water to disguise any bathroom noises. As a country renowned for their innovative electronics, it doesn’t come as a surprise that the Japanese have invented the high tech toilet. Also known as the “washlet” or the “super toilet”, these ultra modern loos are capable of more than all the average joe’s household appliances combined! Adding more than a few personal touches, these tecchie toilets are capable of greeting you, have various spraying functions, a drying capability as well as are self-flushing. 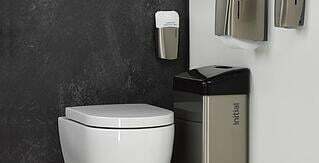 As if that isn’t spectacular enough, there is an even more advanced premium version costing around $ 50 000 (over R 665 000), that plays music to mask toilet sounds, flushes silently and provides you with your very own “spa experience”. The latest advancement in this toilet technology, and in preparation of the 2020 Tokyo Olympics and the subsequent influx of visitors, is standardised toilet icons. For many tourists and visitors to Japan, you can imagine the confusion (and user errors) that could take place. I can just picture myself pressing the wrong button and ending up with soaking clothes! Thankfully, to prevent this, Japan’s Sanitary Equipment Industry has reached consensus to standardise these key functions and icons, and manufacturers have hopeful expectations of this becoming a global standard. Biofilms are a combination of bacteria and slime that gather on surfaces. Think of biofilms as a protective encapsulation (referred to as “chemical polymers”) that shield bacteria from external factors. Tribonet.org describes that microorganisms form biofilms which are water-repellent, making it a challenge for running water to wash them away. Fortunately for the world of hygiene technology, a US study of biofilm prevention by scientists, C. Moraru at Cornell University and D. Borca-Tasciuc at Rensselaer Polytechnic Institute and their teams, had led to the design of surfaces containing minute holes that make it difficult for biofilms to form. Alumina based materials have been manufactured with densely packed nanoscale pores. These surfaces were found to be effective in minimising bacterial attachment or biofilm formation in trials with four pathogens - including E. coli and S. aureus. These tiny pores were enhanced by repulsive forces (electrostatic and acid-base forces) between the material and bacteria. This is not the only research done in the field of surfaces that repel bacteria. The Aston University has conducted a study on the efficacy of antimicrobial copper surfaces in fighting infection with various international confirmed clinical trials. At Birmingham’s Selly Oak Hospital, touch surfaces such as door handles, toilet seats and light switches were replaced with copper which has shown incredible results. In fact, patients in ICU’s which contain copper surfaces have a >40% reduced risk of contracting a medical associated infection than in rooms without copper touch surfaces. Impressively, this study also found 90% fewer microorganisms on copper surfaces (and this with regular cleaning!) compared to other matters such as stainless steel. Various healthcare providers and hospitals have adopted antimicrobial copper surfaces around the globe. After discussing these very innovative hygiene developments, I must say that it is difficult to predict anything more astounding. But how about an app that finds the nearest high tech, nanoscale pore covered toilet? Just kidding! Jokes aside, there is no doubt that with continual medical and technological advancements I will soon have to write another blog post on further innovations. Initial’s feminine hygiene units. These are developed with antimicrobial surface technology to prevent the spread of bacteria. HygieneConnect; a wireless system that anonymously monitors handwashing standards to increase compliance of good handwashing practices. This device shows the handwashing compliance percentage by monitoring amount of people entering the bathroom, and those that wash with soap and water. Subscribe to our blog for more interesting and exciting hygiene news. One of the major issues affecting hygiene is the availability of safe water. What the water crisis in Cape Town has taught us is that saving water is a civil responsibility.